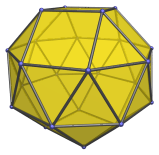 The gyroelongated square bicupola is the 45th Johnson solid (J45). 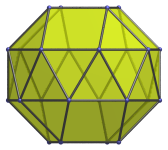 It has 24 vertices, 56 edges, and 34 faces (24 equilateral triangles and 10 squares). 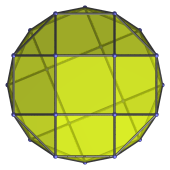 The gyroelongated square bicupola can be constructed by attaching two square bicupolae to an octagonal antiprism, or equivalently, adding a second square cupola to a gyroelongated square cupola (J23). 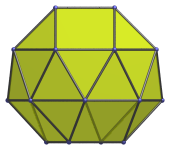 where H = √((1+√2)(√(1+1/√2)−1)), or approximately 0.860296, is half the height of a hexagonal antiprism of edge length 2.